Trying to narrow down the best Metroidvania’s on the Nintendo Switch is a daunting task indeed. Hollow Knight has had my undivided attention for a while now, but when of the most critically acclaimed Metroidvania’s finally lands on the Switch it’s hard not to pay attention. Guacamelee! made a huge splash when it released a couple years ago from developer Drinkbox, and now we are finally able to play one of the greatest Metroidvania’s of all time on Switch as Guacamelee! Super Turbo Championship Edition. The story of Guacamelee! tells the unfortunate narrative of Juan Aguacate, a simple farmer from a small Mexican village out to find his childhood friend and love interest. This potentially momentous reunion takes a slightly dark turn when he perishes in a brutal way. Donning the Mask of Power though, he returns from the dead to find his love has been snatched up by the evil Calaca’s who intends to sacrifice her and unite the world of the living and the dead. There are moments in many great titles where the protagonist stages an exultant return in an expeditious manner, leaving you pumped for the inevitable retribution run that will see you lay waste to those who dare cross your path. Guacamelee! captures this beautifully with the miscreants you’ll have to drop kick being likable and annoying in the right quantities. Humor proliferates the experience and the story is full of adult and contemporary references that it kept me completely engaged. The delivery ends up being near-perfect in tone and execution. I had never completed the original Guacamelee! on PS4 and I couldn’t help but be caught in the possible over-hype a title like this might bring from fans. Fortunately, this is not the case and controlling Juan in a variety of quirky costumes, that you can unlock with gold coins, never got old. In towns, you can gather a number of side-quests from a plethora of eccentric characters that wouldn’t be out of place in similarly zany adventure games. These reward you with experience coins and glory amongst the townsfolk. 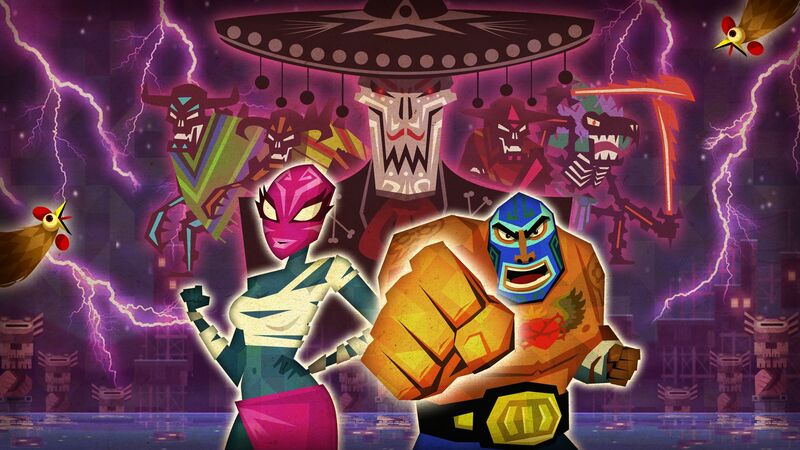 Everything about Guacamelee! is lovingly crafted and the gameplay is at the forefront of the experience. Juan has a number of abilities based around his impressive physique. These are unlocked while exploring the world and destroying sacred statues, much to the disappointment of your sensei who has the ability to shape-shift into a goat. Once destroyed you unlock a permanent character upgrade that will allow you to access new areas and story options. There is a rudimentary teleportation system that allows you to transport quickly from one area to another as long as you’ve visited it previously. The real breadth of the Guacamelee! lies in its combat system. For those new to this type of game, the uniqueness in combat comes from the grappling system. You can pummel enemies a few times to soften them up an then you are presented with the option to grab them with the X button. From there, Juan can suplex or throw them into other enemies in any direction. These abilities can be leveled up visiting one of seven shrines throughout the levels. As you learn new moves by destroying shrines, your combat possibilities open up. The trigger can be used to roll, which offers invulnerability and is key to defeating certain enemies. This same move is used to pass through some environmental hazards and combining this with the latest skills you can expect some very tricky puzzle platforming sections. Regarding platforming, the majority of it is done well, but later near the end, it gets extremely tricky and I did have some frustration. Another unique mechanic is the ability to warp between the spirit and real realms and this changes the world around you, oftentimes allowing access to inaccessible areas. It was a great moment when this was incorporated into combat and having to quickly shift between realms in order to eliminate enemies on the other side is a masterstroke, while also still being able to take damage from enemies in the opposite realm. You also unlock the ability to enter Rage mode by killing enough enemies, which fills more quickly by performing longer combos. When full, you can unleash the ultimate energy by your luchador by clicking the left and right triggers together. You become stronger and faster, leading to some great gameplay moments. Co-op play with up to four other players is easy to perform with each person only having to press A on a controller, choosing a character, and then you’re off playing. Co-op play is an awesome bonus in an otherwise already content-rich experience. Visually, Guacamelee! looks fantastic, either on the big screen or in handheld mode. The gameplay is fluid and the environments ooze a confidence that, while not like any other Metroidvania on the market, carries the same sense of self. This is a unique world with colorful imagery, a powerful art style, and small details in the world are lovingly crafted. Just like the visuals, the audio is incredibly important and Guacemelee! is perfect in this area. The authentic music really stands out with upbeat and energetic rifts showcasing the best of Mexican culture. Overall, Guacamelee! Super Turbo Championship Edition is a must-buy on the Switch if you haven’t played it before and is worth a second purchase if you have played it on another platform. Guacamelee! easily joins the ranks of the best indie titles available on the Switch. There is content galore and the option to play co-op with up to four of your friends is the icing on the cake. This is an experience you don’t want to miss and Switch is the definitive way to play. I am looking forward to playing this one and its sequel as well.